Park at the Reed's pullout on 120, walk up the climber's trail to the start of of Reed's Direct and turn left following the base of the cliff past the Remnant. A prominent cave/corner is met, go down and around past "The Tooth" (another fragment). Scramble up the 15' step to the base of the climb. Pro: 2" to 6" but take a rack with a set of nuts (for in the pod) and a single set of cams from 3/4" to #4, take 2 #4.5 and you might like a #6 BigBro. 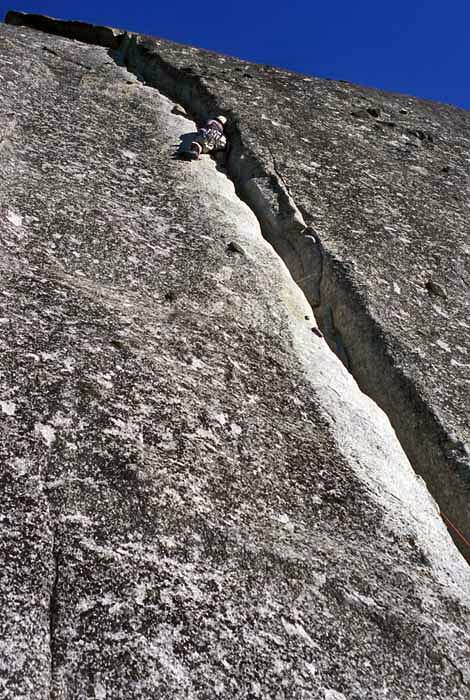 The top of the first pitch is a 2 bolt anchor exactly one-half of a 70m rope to the ground. This can be accessed via the Iota Chimney. Gary Carpenter leading through the crux. The crux of this route is mid-height, after getting through the pod and into the crack above rest on the diorite knob on the face to the left. The next 10 feet are the technical crux to the next knob rest. After that it is a relative cruise, eventually getting into the big section with heel-toe jams which you have to run out to the chains.